Flight Lima to Cusco (1 hour). City Tour Cusco: Cathedral, Qoricancha, Sacsayhuaman, Tambomachay ... (evenings from 13:30 hrs - 18:30 hrs.). 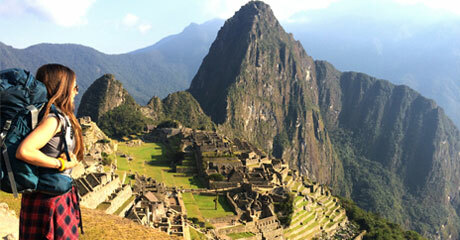 Tour to the Sacred Valley of the Inkas (all day from 08:00 hrs - 19:00 hrs). Transfer from the hotel to the terminal in Cusco to Puno tourism. Guided Tour from Cusco to Puno (All Day 08:00 hrs - 18:00 hrs). In the afternoon travel by bus from Copacabana to La Paz. Reception at the Bus Station. Excursion to the Salar de Uyuni. Visit to the "Fish Island" and the Hotel made of Salt. Tour to Salt desert, visiting the lakes. Visit to the "lake of color" to see how the water seems to change color. At approximately 18:00 hrs. we will go to see the Geiser. We can rest in "Laguna Capaña" where we can realax in Thermal waters. Visit to Laguna Verde to observe the color change of this shortfall. In the afternoon transfer to Uyuni at 18:00 hrs. Reception in La Paz and accommodation at the hotel. City tour to "valley of the moon"
Transfer to bus terminal in La Paz. Bus from La Paz to Puno (Morning from 07:00 hrs to 13.00 hrs). Tourist Transportation La Paz - Uyuni - La Paz. Transport from the beginning to the end of the tour in Uyuni. 2 lunches, 2 breakfasts and 2 dinners at the Tour in Uyuni. 1 Night hotel in La Paz. 1 Transfer from the bus terminal to hotel and hotel to the bus terminal. Tour a Machupicchu "The lost City of the Inkas" From 05:45 hrs to 06:00 hrs., we pick you up from your Hotel in Cusco (3400 mosl) and drive you to the Train Station, located in Poroy, then we get aboard the train and the trip from Cusco starts heading to Aguas Calientes (2000 mosl). Our Guide Will be waiting there, he will lead us to the bus station, to go up by a zigzag way for 30 minutes to reach the world wide marvel The Sanctuary of Machupicchu, known as the lost city of the Incas. Once we get to Machu-Picchu, We'll pass throught the control, where we'll hand in our entrance tickets and where our guided tour will start, visiting the main square, the Circular tower, the sacred solar watch, the royal rooms, the temple of the three windows and the cementeries, it lasts around two hours. Then you can visit any restaurant in Aguas Calientes or if you wish at Santuary Lodge (this is not included). TOURIST TRIP FROM CUSCO TO PUNO, VISITING RAQCHI After breakfast, we will take you to the bus station to start with our trip to Puno this a tour lasts around 8 hours you will have 4 guided visits, Andahuaylillas's temple or South American Sixtine Chapel, the Inka temple of Raqchi, Buffet lunch in Sicuani,La Raya at 4335 m.a.s.l and the Inka Aymara museum of Pukara. Every visit has a duration of 20 or 40 minutes, where the passenger will be able to make questions, take photos and walk a for a while, doing our trip very pleasant .Then we wll arrive in Puno, and our staff will take you to the Hotel. (Photo: Raqchi). TOUR TO THE TITICACA LAKE, UROS ISLAND AND TAQUILE Early in the morning you will be picked up from your hotel by our local guide and then transferred to the harbor. We start off our boat excursion of Lake Titicaca by visiting The Uros Floating Island, a small community that has lived on these reed Islands for decades. Centuries ago the small indigenous Uros tribe conceived of the islands as a way to isolate and protect themselves from rival tribes, the Collas and the Incas. The Uros people harvested the reeds in the shallows of the lake, bundled them together tightly and built floating island platforms complete with reed houses and canoes, creating in this way their own little world. After strolling around the floating Islands, we continue our journey towards Taquile Island (2 hour aprox. ), a traditional Quechua speaking community, full of ancient agricultural terraces and some ruins dating back to the pre-Inca times. The Taquile population was relatively isolated from the mainland until 1950s, and the notion of the community and family is still very strong among them. At the top of the Island, you will have free time to explore this place on your own and afterwards you will meet the group for lunch at one local restaurant. After lunch, we will descent to the harbor to take our boat back to Puno. We will be back in Puno by 17:00 hrs. approximately. Flight from Juliaca to Lima After breakfast at hotel, take some time off to visit the center of the city of Puno, at a time that we will indicate the hotel pick up and transfer to Juliaca airport which is about an hour from Puno, there is check at the airport counter, they hand over their flight and then take the air flight to Lima.